As I dive deeper into this whole blogging land I am discovering there is a lot to know and learn. It is a vast community of bloggy people that seemingly know a lot more about the land than I do. But I am diving in a little deeper today and linking my blog to someone else's. A really great bloggy person at allthingsfadra.com. She is fun and funny and interesting. 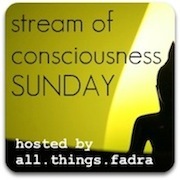 Every Sunday she hosts what she calls a "stream of conscious Sunday" where bloggers simply write for five minutes and don't look back. No editing, no spellcheck (I should be good because I never do that anyway). The topic/writing prompt of today's Stream of Consciousness is "How does winter make you feel and what do you do with those feelings?" Winter has been pretty warm here in Michigan this year. It has been a bit unsettling. Don't get me wrong, I am not really a winter kind of gal. I prefer the beach to the snowy meadow. I love slipping on a pair of flip-flops and heading out the door, rather than the coat, that hat, the gloves, the boots. And don't forget the extra pair of dry shoes. Ugh. But, 50 degrees in January in Michigan? Not right. You see while I am a summer type gal, I am also a routine, everything has it's place kind of gal. I don't do Christmas in July or breakfast for dinner. So, January in Michigan means snow, cold and a tad bit of melancholy. This weekend has been frigid and it snowed a little bit. And that makes me happy. Okay, wait a minute, now things aren't right because I am happy in Michigan in the winter in January. Uh-oh, I guess I am discovering that I am that type of never satisfied kind of gal. January and winter is also about resolutions and new beginnings. So maybe I will resolve to appreciate the moment whatever the weather. And be a little more satisfied. Okay. That was super nice of you to say about me and this post is so interesting to me. You're a warm weather gal but you live in Michigan. But without the cold and snow, winter seems foreign to you. It's odd because I was just reading about snow in Seattle where I thought they never got snow! Strange days indeed. Hope you link up again!